That’s one of Mike’s favorite descriptions of outings in which the accumulation of miles manages to drain most of the fun out of a walk in the country. It’s pretty much what my Saturday was like, back at Calero County Park under hotter, sunnier skies. I practically dashed through the first 8.5 miles, at which point I realized I was a) almost out of water; and b) 5.5 miles from where I started. The water issue wasn’t a big deal, as I had my trusty water filter and knew where to get a refill. Walking last few miles in the blazing sun was another matter. Last week I concluded it would take some doing to conjure a strenuous outing at Calero; the hike from the trailhead to the ridge at Bald Peaks Trail is a couple miles, steep enough for a mild workout but essentially a bunny slope compared to, say, Mount Diablo or the hills of Henry Coe State Park. The one way to make things interesting after Bald Peaks is to take the Serpentine Loop trail, which gives back all that elevation gain (and more, I suspect) on a lolling slope down into a valley from which it’s a 900 foot climb back up to Bald Peaks via either the 1-mile link on the Serpentine Trail, or the much more interesting 3.9-mile route on the Longwall Canyon Trail, which leaves the park and twists its way through the adjoining Rancho Canada Del Oro Open Space Preserve. I went the long way. I had it in my head that this week would be just like last week, which it was except for twice the climb, 40 percent more mileage and 20-degree hotter weather. It got a bit tiresome for the last few miles. In retrospect, though, all my suffering was self-imposed. Should’ve shaved a few miles and shown more respect for summer’s approach. 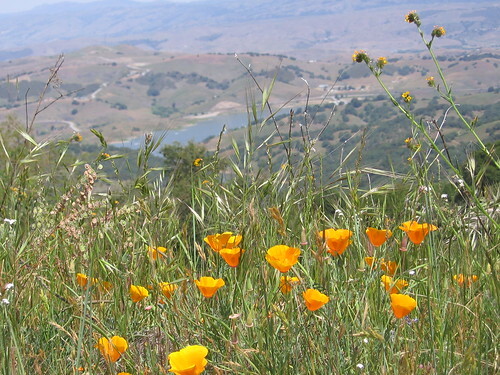 As I mentioned last week, Calero’s a fine place to go hiking for hiking’s sake. It doesn’t have the attractions — rock formations, waterfalls — that draw people to the top hiking destinations, but it does have quite a few shaded miles where you can amble along and soak up the sounds of bugs and birds chattering back and forth and just sort of revel in the experience of being out there all by yourself. Enough yammering; let’s look at some pictures. You like horses, right? I saw less than 10 in seven hours of hiking, and even fewer hikers. These hills are utterly uncrowded, which adds to the appeal of a hike here. 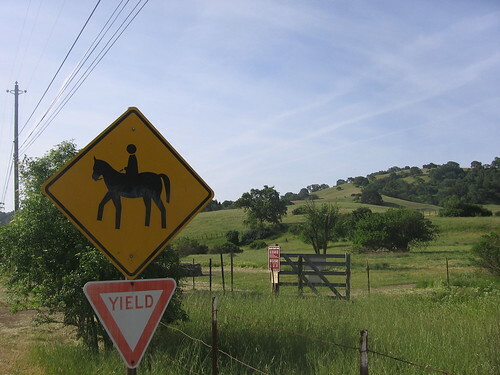 Calero’s primarily a horse park, with watering troughs placed strategically along the trails. If you bring some water treatment methods along you shouldn’t have to to worry about dehydration. (Realistically, though, come July and August it’ll be just plain too hot to hike comfortably out here). Los Cerritos Pond, about a half-mile from the trailhead, is one of the most photogenic places in the park. It also has one of those display boards describing the footprints of all the critters in the park — coyotes, bobcats, mountain lions, wild pigs, deer, raccoons and various birds. I saw turkeys, vultures, a bobcat and a the butts of a couple deer. Didn’t see the mountain lion but by many accounts, it’s out there. 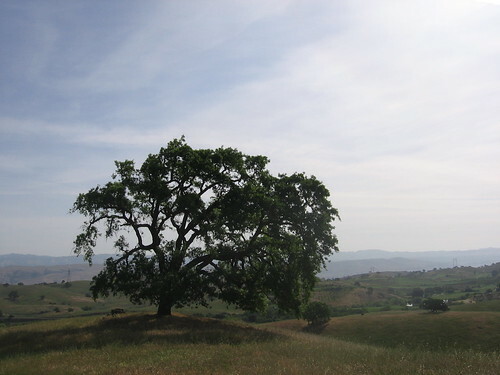 Calero’s oak trees are among the coolest in any of the county parks. Oaks in the East Bay always seem overstressed, while the ones here seem more vibrant (might be there’s more moisture in the air because it’s closer to the ocean). 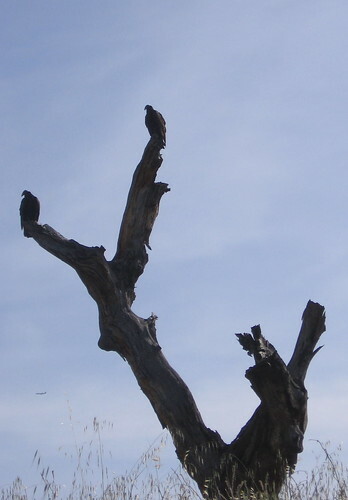 Vultures look like extensions of the branches on this old snag. Green glades like this one are fairly common along the trails but the green’ll be gone soon, probably in the next couple weeks, the way things are going. A good year for poppies, though the other wildflowers haven’t been quite as profuse as in years past. Last year we had too much rain; this year, too little. Maybe next year will be just right. 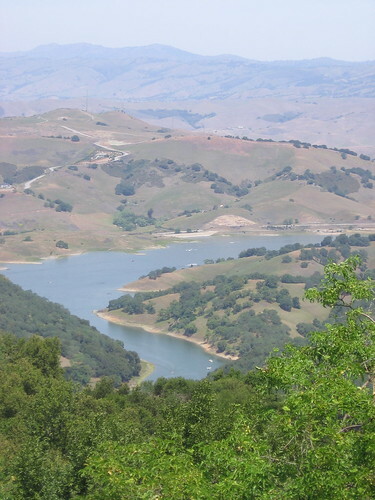 Calero Reservoir looks like the place to be on a sunny Saturday, particularly from up here on the Bald Peaks Trail. I saw a bobcat not far from Fish Camp, site of this pond along the Javelina Loop Trail. The climb to this location goes uphill for less than a mile and is probably nothing terribly difficult if you’ve got fresh legs and fair weather. After 12 miles, hiking uphill in the blistering afternoon sun definitely drifted into the un-fun zone. The sunshine is why I stay in California, so I don’t get too resentful when I experience too much of it on the trail. Calero has enough shade to get cooled off, and enough open country refresh one’s belief in the possibilities of solar power. 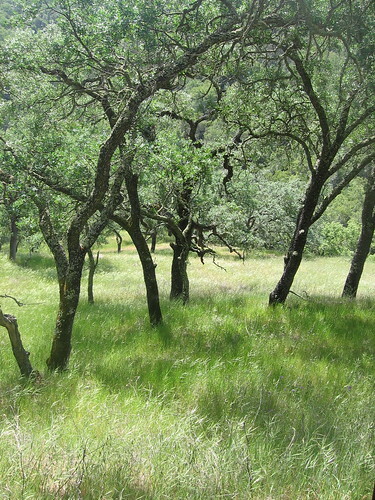 It also has trails that start out as open wagon roads that unexpectedly narrow into forested single-tracks (just watch out for the poison oak). 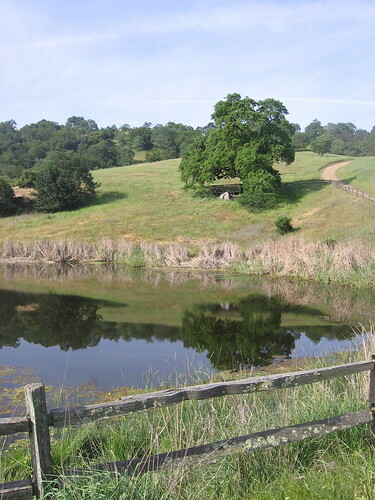 Serpentine Loop: 3.2 miles, accessible via Bald Peaks Trail and trail spur to Rancho Canada Del Oro Open Space Preserve (which has a privy and water for horses). Around 900 feet of elevation gain/loss. Steep in places, some shade, mostly open. 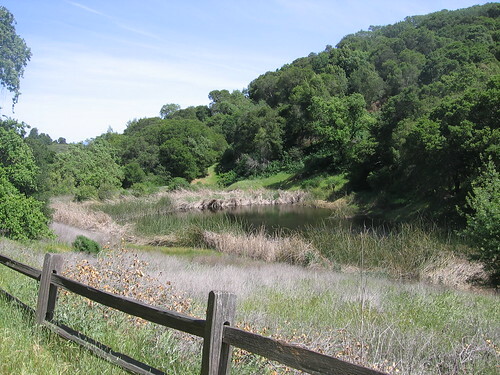 Longwall Canyon Trail: 3.9 miles and 900 feet of elevation gain, starting from Rancho Canada Del Oro Open Space Preserve trailhead. Good way to add a couple miles to the Serpentine hike; fairly sunny at the beginning; narrows to shady single-track after a couple miles. Last mile to Bald Peaks Trail is all exposed, but has excellent views. Javelina Loop, lower section. 1.5 unshaded miles. Short but steep hike to Fish Camp, about halfway through, which includes a pretty pond with a watering trough and shaded deck. Great place for wildlife watching.